No matter the medium—from print to broadcast to digital—Working With Words presents the best writing advice for today’s journalists. 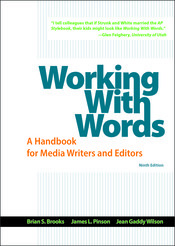 The text’s focus on improving skills in grammar and style make this an invaluable reference for students from their introductory journalism courses throughout their future careers in the field. With extensive coverage of grammar, mechanics and usage, as well as style, unbiased writing and writing for different media, Working With Words includes material that students cannot find in the Associated Press Stylebook alone. New with the ninth edition, Working with Words can be packaged with LaunchPad Solo for Journalism, where students can access the Exercise Book for Working With Words – an interactive workbook with multiple activities matching each chapter topic in the main text. Also on LaunchPad, students can further their grammar practice with Exercise Central for AP Style, and watch numerous videos from renowned journalists.